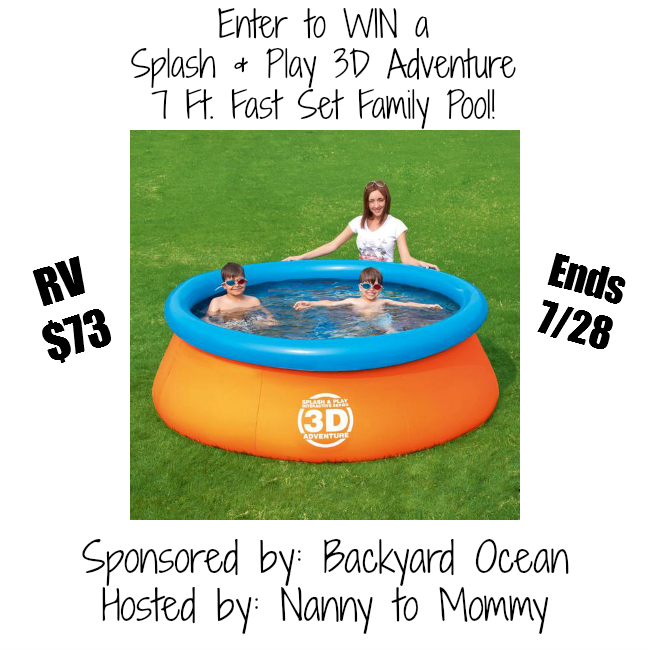 Welcome to the Splash & Play 3D Pool Giveaway Event! Summer is on it's peak, so it is great to enjoy hot and sunny weather adding some water fun for everyone. Kids can't wait to spend more time outside swimming, running and playing at splash pad areas around the city. Nanny to Mommy recently had the opportunity to review some items from Backyard Ocean, read her full review here. One VERY LUCKY reader will receive the opportunity to WIN a Splash & Play 3D Adventure 7 ft. Fast Set Family Pool of their very own from Backyard Ocean. This pool retails for $110, but is on sale for only $73! This pool has 3D imagery inside the walls that you can see when you wear the 3D swim goggles. Two goggles come in with the pool, more can be purchased for $24.99 in a set of two. Participating bloggers are not responsible for sponsors who do not fulfill prize obligations. Diana at Nanny to Mommy received products complimentary from the sponsor in order to provide an honest review and share this giveaway. No additional compensation was received. All opinions are 100% Diana's from Nanny to Mommy. Giveaway open to US only, must be 18+ to enter. Winner is chosen via Random.org. All winning entries are verified. No social media was involved in this giveaway in any way. If you are interested in hosting a giveaway like this for your product, please contact diana.n.chastain@gmail.com. Thanks!